Teacher Bits and Bobs: Going Buggy! I hope the weather where you are is as beautiful as it is here in Cali! Wow! Spring has sprung! 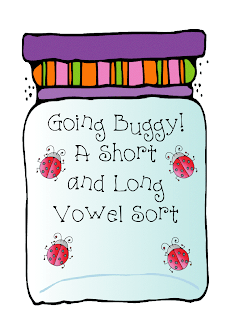 I made this little bug center a while back to help my kids review short and long vowel words. They had fun sorting the ladybugs into the correct jar. After they finished I had them do a cut and paste sort of short and long vowel words. Click on the links above and below to download the center and the sorting worksheet/words! Enjoy! What font do you use on the first 2 downloads??? I think I used DJ Basic on both of them. I also used DJ Attitude on the title that is on the jar. Right now DJ Basic is my fave...very clean and cute. Thank you for your candy bar measurement and the word search today. I am SOO doing that measurement activity when we get to that unit! AWESOME!